couldn't do this work on the 7x10. the workpiece was just sitting around waiting for the 8x12 to arrive. 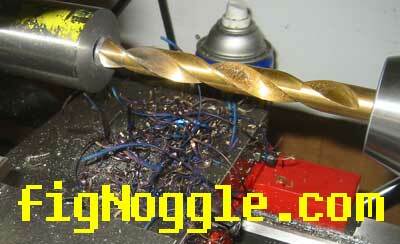 finally get to use a 1/2" jobber drill bit. 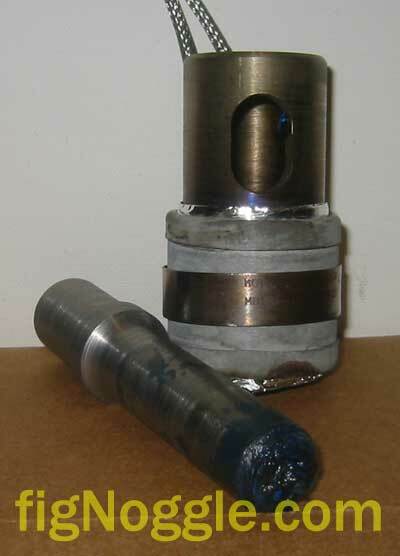 the workpiece is a 5-6" long 1.5" dia. oil hardened drill rod. the tailstock has just enough room on the bed. check out the color of the swarf. what a nice color of blue/purple. also was able to drive the bit hard enough to hear the crunching sounds of the synch belt stripping! still works. better get some more belts just in case. 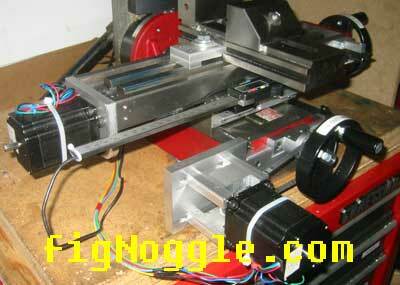 back to the cnc conversion (v2). 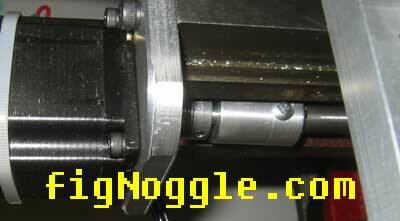 finally made a step-down shaft adapter for the flex coupling. the old one (see right) was modified. 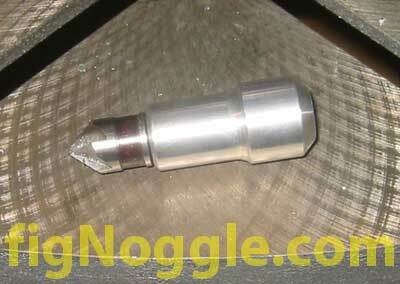 turned down one end to .250"
installed back in the x-axis shaft. larger view. 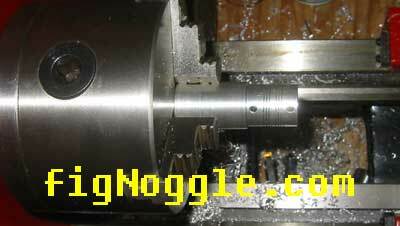 see more of version 2 of the cnc conversion. plans are available. leadscrew turning and bearing block housings made. click here to see the upgrade. 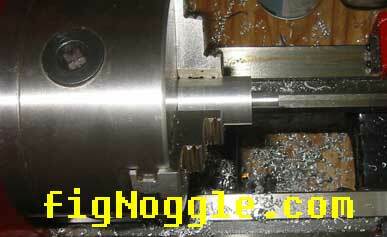 It's nice to have drilled holes with a slight chamfer in them so that threading or hole locating becomes easier, but primarily the chamfers make the holes look much nicer. 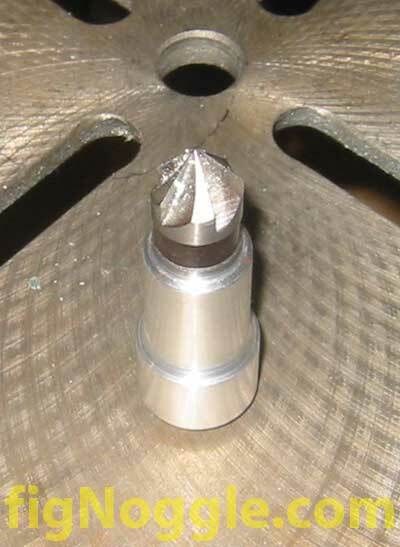 We had been using this old 5/8" diameter countersinking bit that has only a 1/2" long shank on it by hand to turn it in holes to countersink them. After a while it became hard on your hands. Instead of buying a handled version, we just chucked in a 1" diameter piece of aluminum round bar and tuneded down a little palm-sized "knub" holder as a handle. 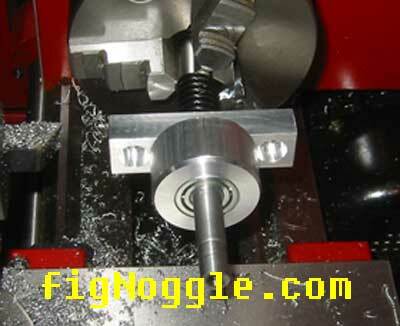 We drilled a slightly smaller ID'd hole than the OD of the shank by a few thousandths and simply pressed it in using the arbor press. How would we remove it later? We had drilled that hole all the way through the handle so that we can insert a dowel pin or something using the arbor press to again push it out. Note that the stepped down shank of the handle is actually slightly larger than the OD of the bit. 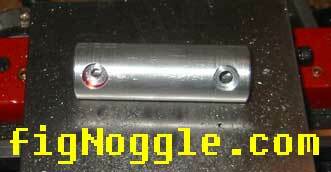 This allows for the handle to sit properly on the arbor press plate as the bit's driven out later. This could have also been accomplished using the step itself. This project takes just minutes to do and is quite simple.